It is rare for me to make steak or roast beef without having some left over beef. 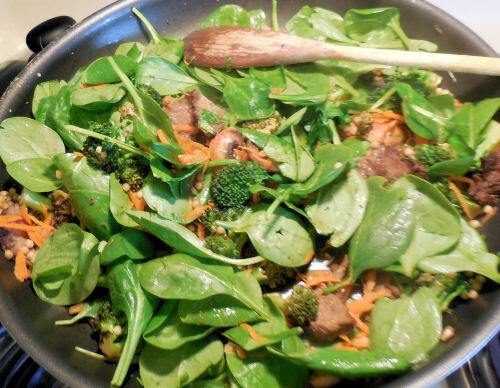 I’m always looking for ways to use up the extra pieces in a tasty and healthy way. I made steak with a rosemary and balsamic glaze the other day and had one small piece left. 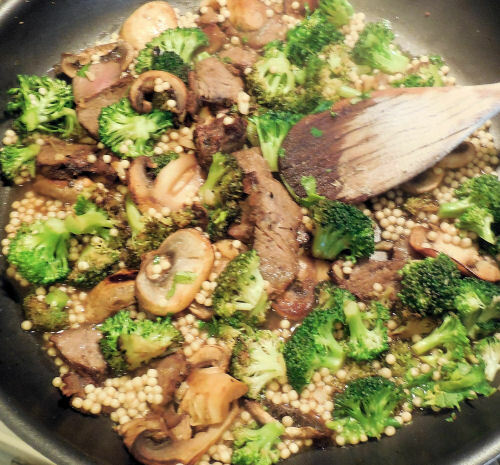 So I came up with this recipe fir beef broccoli stir fry..Like all 30 minute meals, it’s ready in a flash. This dish is one my my family’s favorite one pot meals. 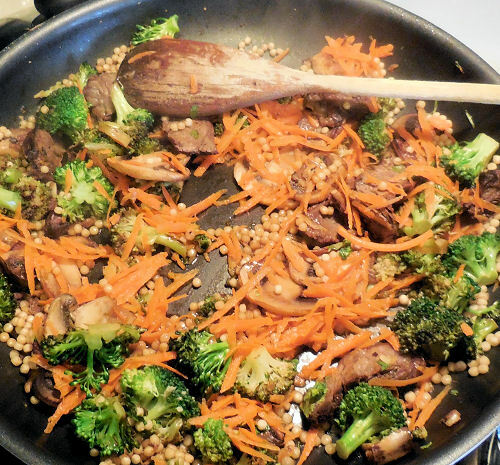 Even the couscous is cooked in the same pan, making clean up a breeze. Broccoli is one of the favorite veggies in our house. I love using it in broccoli salads, main courses and soups. 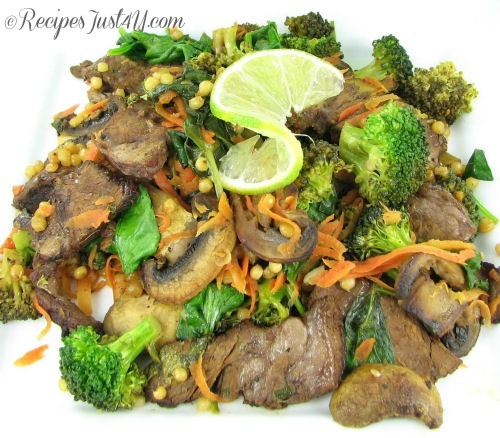 For today’s recipe, broccoli is the star of this amazing stir fry. 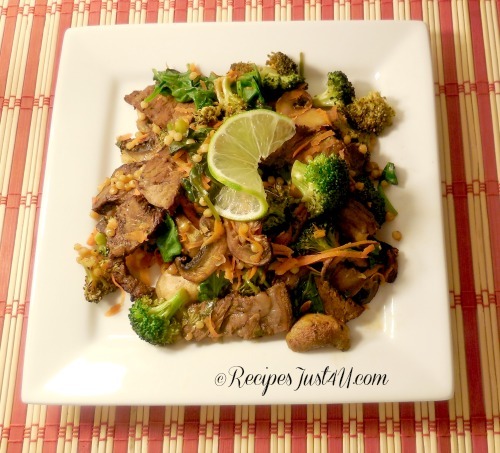 This beef broccoli stir fry was the oddest recipe I have ever done. I just kept adding things I had in the fridge that needed using and it ended up being really delicious. 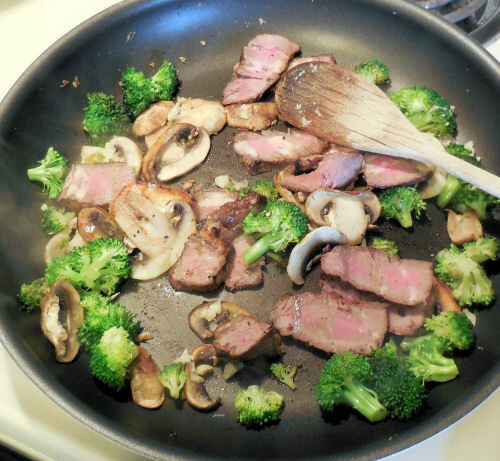 I started by heating broccoli and mushrooms in a non stick skillet that I spray with a bit of Pam buttery spray. Next came some garlic, a small piece of grated ginger and my left over steak. It was starting to take effect nicely. My daughter left me with about 3 tbsp of Middle Eastern Couscous (which she discovered in my pantry over Christmas and found that she loved!) So I added that to about 1/2 cup of beef broth, zest and juice of 1/2 lime and 1 tsp of low sodium soy sauce. I decided that it was not colorful enough, but it was too late for sliced carrots, so I just grated a medium carrot and in it went. Last but not least, 1/3 of a bag of baby spinach went in to make it even more healthy and also because I love the taste of spinach. I added a bit of Kosher salt and cracked black pepper and allowed the spinach to wilt. Finally, I added about 1 tablespoon of fresh chopped cilantro, left over from my famous guacamole recipe and I was done. And now for the taste. It was really nice! The middle eastern couscous picked up the lime and cilantro showcased the lime well. Since I used low sodium soy sauce, and very little salt, it had exactly the right seasoning without being too salty, which I hate. 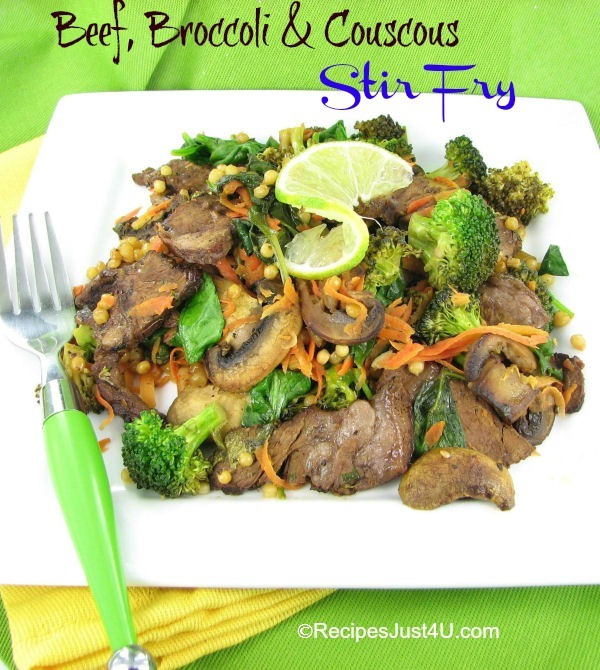 This easy stir fry recipe is a great meal for two option when you are pressed for time. Kosher salt and cracked black pepper to taste. 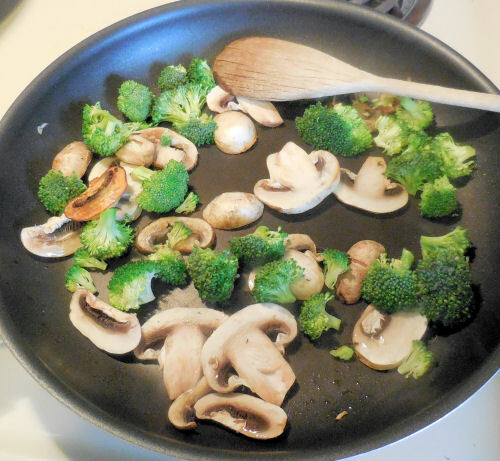 Heat the broccoli and mushrooms in a non stick skillet that is sprayed with a bit of Pam buttery spray. Cook until the broccoli is starting to get tender and the mushrooms have turned color - about 3 minutes. Add the garlic, a small piece of grated ginger and the steak. Stir to combine and cook for 1 minute. Mix in the 3 tbsp of Middle Eastern Couscous. Add the beef broth, zest and juice of 1/2 lime and 1 tsp of low sodium soy sauce. Heat for 2 minutes. Stir in the grated carrot and heat just about 1 minute more. Add the baby spinach and season to taste with Kosher salt and cracked black pepper. Allow the spinach to wilt. Stir in 1 tablespoon of fresh chopped cilantro and serve immediately. Wonderful flavor and texture combinations in this recipe!